There are many styles of wedding photography. Very roughly they can be divided into the three types below. Be aware however there are other slightly more “off the wall” and unusual types and there is also a great deal of cross over between all types. This type of wedding photography is what we are used to seeing and while currently out of fashion it has become more popular in the last two or three years. Essentially it will consist of posed groups and portraits work to a script. Even through it is not so fashionable at the moment these will still be the pictures you see hanging on walls and in the frame on the mantle piece. This type of wedding photography has stood the test of time and will always produce the record shots that you will look back at in years to come as a permanent reminder of your magical day. The benefits are that you will get all the pictures you expect and the final album will be attractive if predictable. Much more in fashion at the moment a photojournalistic approach will do what it says and, correctly executed, produce for you a story of your wedding day. 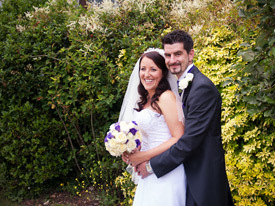 The aim will be to record the events of your wedding in a chronological order from a slightly more remote viewpoint. There may not even be any formally posed pictures and the photographer may simply stay in the background and catch snapshot images of various parts of the day. At the end of the day you will probably have a wonderful storybook which will always bring back happy memories. Remember these will not be the pictures that mum will want to proudly display in a frame for those you need a few traditional shots. The biggest single benefit of this style of photography is that your will be able to tell a story in pictures. The disadvantage however is that you are relying on the photographer’s instinct and the results can be unpredictable. Contemporary photography is by its nature very difficult to quantify and can mean different things to different people, to be fashionable or contemporary it must by definition be constantly changing. This means that your pictures can date very quickly. The way this type of photography works is that the photographer finds settings where the lighting is good and the backgrounds beautiful and then photographs the bride and groom in a more idealised setting – when done properly the results can be stunning! These will always be the pictures that win awards and grab people’s attention simply because they look like they have come from the glossy magazines. The major benefit of this type of photography is the feel good factor it generates – doesn’t everybody want to look good and imagine themselves in the glossy magazines? Of course you do it’s only natural and so you should on your wedding day – you are the star!